Have You Tried Sprouting This Spring? Just as easy as tying your shoe, making your bed, or brushing your teeth, as long as you catch on to a few simple steps, you can have sprouts coming out of your ears! I learned from The Sprout Guy that you don’t need a ton of space to grow sprouts, and you don’t even have to attend to them all that often. If you think one tablespoon doesn’t seem like much, it is! 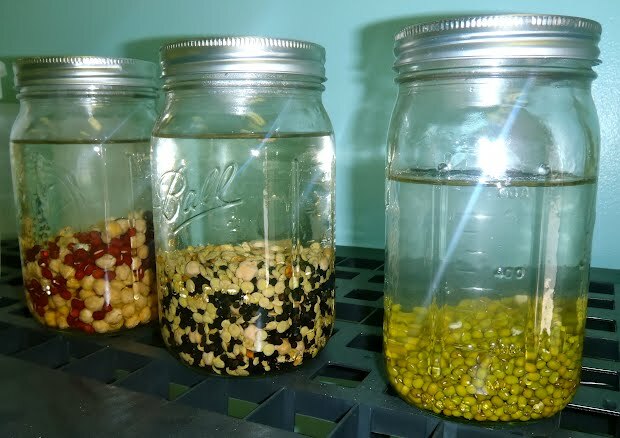 Just one tablespoon will fill the mason jar with sprouts! You can also check out Sprouting 101 from the Sprout People for additional information and tips. Jeremy began growing his own sprouts in his own kitchen after becoming a vegetarian and enjoying the raw food diet. He quickly became known as The Sprout Guy, and before he knew it, he was starting to grow enough sprouts to make mixes, hummus, and other tasty toppings. Jeremy loves to show everyone how easy it is to use sprouts on just about everything, and he always highlights their nutritious value! Sprouts are quick to germinate and low-maintenance to grow, so they are the perfect addition to any dish that needs a little updating! This entry was posted in Food Warrior Interns, On the Farm and tagged food warrior interns, how-to, natalie machado, Real Time Farms, sprouting, Sprouts, the sprout guy. Bookmark the permalink.